A sound iterated, reiterated, then—(silence)—again: fixed, secure. A point in space? Possibly, but now merely a point. Call it "M3." COMMENTARY: "Major-3"? "Major" because slightly larger than its immanent assailant, "m3" ("minor-3"), that enters shortly. "3" in both cases because both are somehow the same; both are protagonist and antagonist; the other sizes, for the most part, play incidental roles. When heard at all, they are clearly other than "M3" or "m3," doing something other, being something other. Silence. The sequence begins again. But the interior silence is broken: another "3," much higher, ("much" because my only measure is "M3"'s breadth) yet compressed: "m3." As the "M3" sequence's final reiteration arrives on schedule, "m3" plunges below by that distance which distinguished "M3" from "m3." Yet, is this "m3" at all? It is no longer a two-fold sound; rather, it is a tone lyrically attached to the initial "m3" but, now, so close to "M3" as—almost—to be part of it. As "M3"'s cycle ends with the requisite silence, the tentative answer becomes yes. The silence is broken by a second tone, as far below the first as the constituent sounds of "m3" were apart: an "m3" broken, sideways. At the first iteration of "M3" in this third rhythmic cycle, the marginal, "side-ways" "m3" (its terminus still sounding) creates a new "M3"—the inevitable result of "m3"'s intersection with "M3" and subsequent "m3" escale. 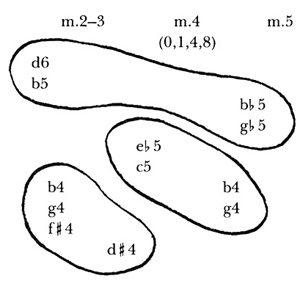 COMMENTARY: Though a "sameness" of "M3" and "m3" is still evident in relation to the space between, their major:minor-ness carries more meaning than merely that of a finer perception of size: minor-third, dynamic and volatile, stands in sharp contrast to Major-third, whose obstinate rhythmic, tonal, and dynamic character remains unaltered. As "M3" is twice reiterated (right on schedule), volant "m3" moves in unison—though rhythmic unison only. Leaping from the bottom of that inadvertently created "M3" stack, it undershoots its mark: no sideways "m3" this time; still, the module is "m3," and the subsequent sideways "m3"—congruent with the second reiteration of "M3"—counters that inadvertent "M3" stack with its own "m3" parsing of the registral space below "M3." But this momentary restabilization of "m3" is overcome by an obdurate "M3"—the "M3." The final sideways "m3" becomes—terminally—"M3." COMMENTARY: There is drama manifest here: the "m3"—making compulsion of this "sideways" moving character is in conflict with the obdurate nature of "M3." "M3" exerts some strong influence upon it which mitigates its "m3" compulsion, drawing it into an "M3" realm: a volatile force and an immovable object. Immovable? The final reiteration of the third "M3" cycle remains; but it sustains, echoes into (what should be) its concluding silence. The pattern is broken; yet, another iteration—sharp, separate—comes on its heels. "M3," in an apparent attempt to extend its registral domain, springs upward by a module of "M3." However, while reaching that modular goal ( 1), its intent is thwarted: the newly formulated "M3" explicitly becomes "m3," suspended from that modular goal. "M3" withdraws to its rudimentary position, pauses, and is reiterated as before. COMMENTARY: The connotations of this moment are vast. That new "M3" stack recalls the first "M3" pull against the "m3" line (measure 3/2); the tables are turned now, however. Taking advantage of its previously disastrous association with this stack, "m3" uses its resonance to reassert itself. But there is more "reassertion" than just this. The space above "M3" is "m3" territory, its only other denizen the aboriginal "m3"—the only two "two-fold" "m3" sonority. The harmony itself, including that dangling "m3," recreates the harmony of the second primitive "m3" harmony (Example 1). 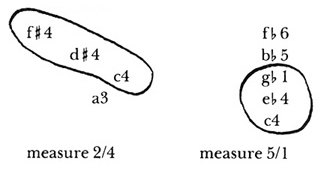 Though the first (measure 2/4) is spread across three time points, and the second across two, the reflection still remains between analogous points (Example 2). This perversion of the "m3"—compulsion (measure three) appears to have been only temporary . . .
For, treating the final reiteration as the end of the eccentric fourth cycle (measure 4/3-4), "M3" makes a second attempt at registral expansion. The results are the same as before: a dangling "m3"; yet, for that very reason, the effect is much more severe. The concomitant images of the aboriginal "m3" are multiplied. COMMENTARY: The "m3" compulsion reasserts itself by expanding the extraneous "m3" (c5/ 5) into an "m3" stack, c5/ 5/ 5, much as "m3"—line's (measure 3) created an unintended "M3" stack. 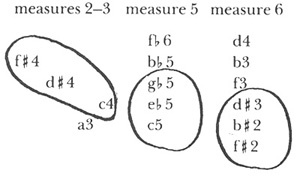 The linear "m3" collection of measures 2-3 is now partially reproduced in stack form (Example 3). 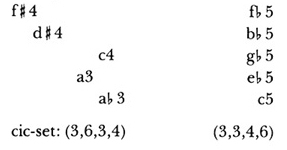 The complementary-interval-class (cic) collection that is this "m3"-line is reproduced as well, but in the stack format favored by the upper register (Example 4). But, once again, "M3" slips away, the "m3" assault unsuccessful. An echo of that increasingly significant "m3"-line does emerge below; but it is already transformed, the "m3" already become "M3." COMMENTARY: The central "M3" of measure 5/1 ( 6/ 6) reemerges in its proper register, 3/ 3. "Proper" because it is the "M3" of measure 3 (c4- 3) moved. It has slipped by cic 2. 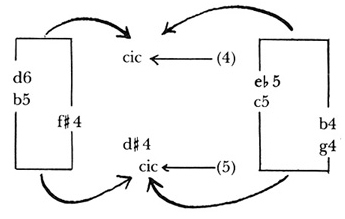 The moment's harmonic resonance remains as well (Example 6). This "m3"-related "M3" has now taken on the characteristics of a true "M3"—stacked format, short, precise—and has lost its "m3"-like volatility. Still, as the primitive "M3" (g4/b4) continues—the usual reiterations and possible beginning of a new rhythmic cycle (measure 5/2.5-measure 4)—the silence expected is broken. The original "m3"-generated "M3" (c4/ 3) reemerges. Moving deliberately and unhesitantly, the "m3"-generated "M3"'s below become "m3": the primal "m3" and its secondary image. COMMENTARY: As 3/ 3 moves back to its pre-image, 3/c4, the harmonic resonance remains, inverting around that 3/c4 preimage (Example 7) (as that highest registral voice, measure 2:d2 becomes measure 5: 2, will ultimately return to its own—df 2-measure 9:d2). The 4 of the second of these "M3" pairs mitigates the emerging a3-c4/ 4 "m3" stack, much as the alien c5 of measures 4-5 broke the "M3" expansion of g4/b4 to 5. At the same time, this very 4—being "E-flat" rather than "E-natural"—breaks measure 6's string of "M3"'s, retaining its "M3"-destroying function. the lowest of which has been with this "m3"-line and its images all along (Example 9). "M3" is obliterated—not subverted (as "M3" subverted "m3" in measures 2-3), but at once wiped from the surface of the piece. The openness—the linear character—of the lower register is clotted by this opaque "m3" stack. It remains. It continues to sound—much longer than any sonority has sounded before. Is this it? An "m3" coup? With the resonant "m3"-ness still below, the primal "M3"reemerges unscathed, well intact, "gut im Takt." And in the silence before the requisite iteration, another ghost emerges: the "m3"-generated "M3." Slipping down by cic 2's, as it had slipped between image and preimage, it continues to color the silence between the inevitable reiterations of "M3"; it continues to slip. COMMENTARY: This "slip" is the same as before (Example 10). The a3/f3-g3/ 3 of measures 7-8, along with the revitalized "M3" above, resonates sympathetically (Example 11). This "M3" stack—the "M3'" stack, that one present in measure 3 and immanent in measure 4—is now (measure 8/1-2) imbedded in its attendant cic 2 field. 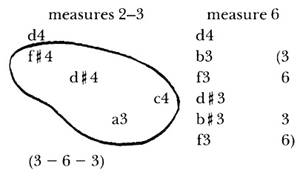 The anomalous cic 2 imbedded in the complex "m3" sonority of measure 6, and implicit in the translation of measure 3:c- into measure 5: / (breaking, for a moment, the inadvertent "M3'" stack at measure 3/2.5) is the measure of all that occurs. It is the module of all measure. Nevertheless, as thrice before, the hegemony of "M3" world is threatened through the invocation of a single harmony, (0,1,4,5) (Example 12). The (cic 2) module is broken, as was the ("m3") module of measures 2/4-3.3 when A-c became c- . The reemergency of "m3" is awaited. However, the primitive "M3" hangs on (as it had after the calamitous (0,1,4,5) of measure 3 and measure 5). And, though the usual "m3" ( 5/ 5) is published, it is ruthlessly contained as a pair of "M3" stacks hold it in thrall. COMMENTARY: The bottom "M3" stack here—g4/b4/ 5, the "M3" stack—is completed for the first time in the upper register without the intrusion of that dangling "m3" ( 5/c5). The return of the upper registral voice to d6 creates a second "M3" stack as it intersects with the 5/ 5 "M3" registrally prolonged from measure 5. The (0,1,4,5)-generated "m3" is subsumed into its tangential "M3" stacks, leaving neatly contained between its tangential "M3" stacks, that single "m3," 5/ 5—the usual consequent of the preceding (0,1,4,5). "m3" is obliterated. No longer a thing in itself, it is merely a distance between. It is an "M3" world.